I remember back in seventh grade and eighth grade (2-3 years ago), when, at my school, having a Sugar Lips tank top was all the craze. They were seamless, flattering, in bold colors, and THE brand to have in tank tops. You know how that goes, right? When you're in school, there's always some brand that's "in"...and then everyone has to have it! I didn't have a Sugar Lips tank top, but all of my friends did. And I WANTED one. Now, three years later and 3 months of blogging behind me (hehe), I've finally achieved popular seventh grader status with my new Sugar Lips dress. Granted, it's not a tank top. And I'm not a seventh grader, either. But my seventh grade self would have loved to flaunt this through the halls of middle school! Not nearly as much as my current self, though. I got compliment after compliment on my "red top" all day long when I wore this bright number to school. I guess my wish of owning a Sugar Lips "top" came true after all. I wanted a suedette cutout tank from Forever21 but of course they were out of smalls...lol. Yoa are adorable!!!! i love your style! Do you want to follow each other via bloglovin?? I absolutely love this dress (uh, tank too?) Lol. The cut outs in the top half are perfect for the upcoming summer too. If only your seventh grade self could see you now, huh? Very cute dress! Love the color of your "top"! 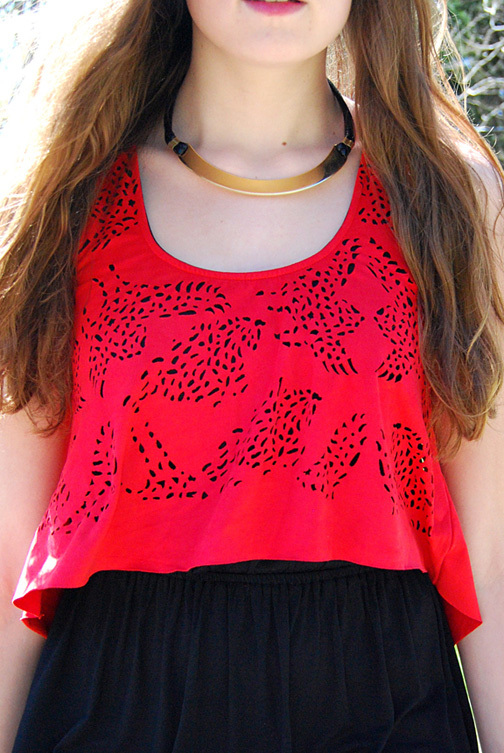 That top is so pretty - I love the cut-out detail! I love a simple black outfit. The pop of color in the red is stunning. Loving that hat too! Super cute! Oh, I am happy your wish came true, dear, better late than never! You look lovely as usual! Aww, thanks for the wordy comment Rory! I'm really glad I've got someone like you to read my blog posts. Haha, it can be tiresome when people don't even read what I've spent time trying to write. I know, the philosophical stuff can be confusing and it takes a lot of thinking through. But it's definitely important to know what you believe and why, otherwise you can be swayed very easily. thank you for the follow on bloglovin..can you please follow my blog too? WE want your outfit! Pretty amazing! Check out ours too.. I really like the tank layered on the dress here. The cut totally makes it work. I need to get myself one cut high in the front and long on the sides like this for the exact same look. Love that outfit!!! I love the skirt wit the shirt!! And the hat adds to it all!